Regular cleaning: The procedure involves going into the space between the gum line and the teeth to clean it thoroughly by removing bacteria and tartar build-up. When a person brushes and flosses daily and gets their teeth cleaned on a regular basis, the bacteria and tartar build-up are minimal. Healthy gums are pink in color, and there is generally little to no bleeding during the cleaning. Deep cleaning: is needed when there is a large amount of tartar and bacteria under the gums. The Dentist hygienist will use their tools to scrape away plaque and tartar on the surface of the enamel up under the gums – not just along the gum line like a regular cleaning. They also reach up along the roots of your teeth to smooth the softer cementum on the surface to prevent plaque from forming in uneven spaces. The entire process takes about 45 minutes per quadrant of your mouth—upper left, upper right, lower left, or lowers right. It may even take multiple sessions to treat all four afflicted quadrants. At Bloomfield Dental Center, our dentist will determine what type of cleaning you will need. 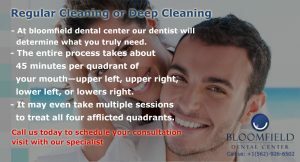 After the deep cleaning procedure, you may experience soreness, tooth sensitivity or bleeding for a few days after scaling and root planning. Don’t hesitate to call us and ask for a follow-up appointment to check how well your gums are healing and the depth of periodontal pockets. Brush your teeth twice a day with a toothbrush and antimicrobial toothpaste. Also, be sure to eat a balanced diet, avoid tobacco and receive regular dental cleanings as recommended by the dentist. Call us now: 562-926-6502 or contact us online to schedule and appointment.